3-year-olds can be quite the cut-ups. Their sense of humour starts to emerge around this age, and they know it. Humour is a form of intelligence, and it's pretty fascinating to watch it develop and share laughs with one's budding comedian. 1. Huge numbers. Ridiculously big or long or numerous things are automatically hilarious; and the bigger, the better. 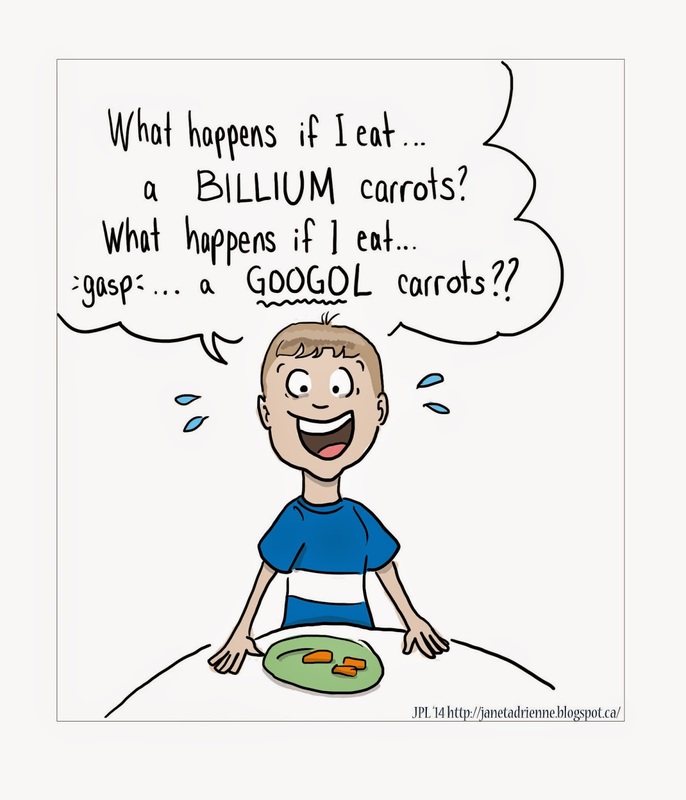 ROFL... a billion carrots was funny, but a googol-- now that's comedy! Imagine that many carrots! I heard a few kids in the strawberry fields recently competing over how many strawberries each would pick. Thousands of strawberries. No! Hold on. HUNDREDS. (Yeah, sometimes the numbers don't actually get bigger, but you just have to go with it). I'm told that, when I was 3, I used to tell the "How many men does it take to change a light bulb" joke in a similar fashion. "I don't know. How many?" my humouring parents would say. "THREE!" (Pause for laughter) "No, wait... FOUR!" The numbers didn't even have to be big in my case. They just had to be numbers, apparently. 2. Nonsense words, in our case largely resulting from activities like singing songs with all the lyrics starting with the same letter. 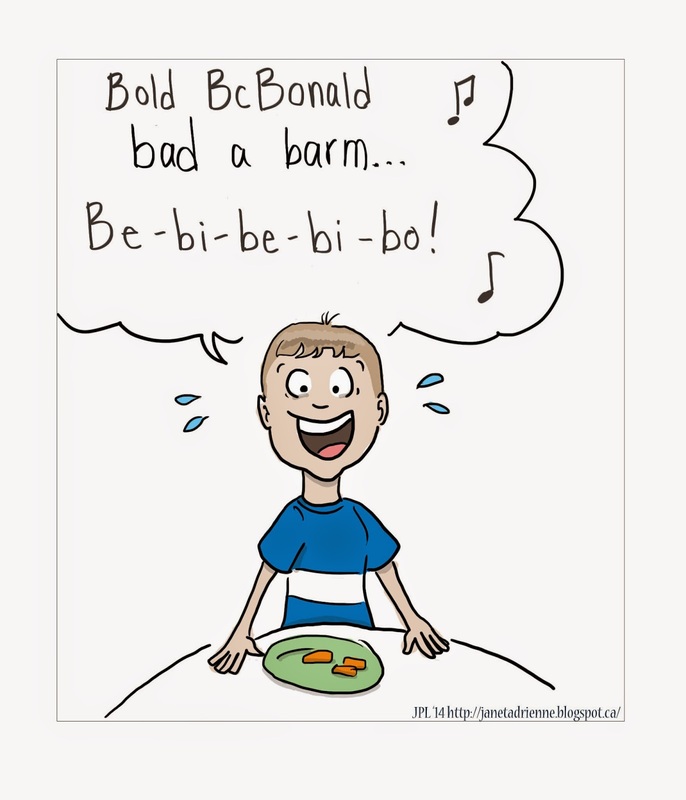 Bold BcBonald? THAT DOESN'T EVEN MAKE SENSE! LOL! You could brush your teeth, or you could MUSH your MEETH! One day he called me Bamba instead of Mama, and he was quite pleased with his sharp wit. I was worried that would be my forever name. Thankfully, the novelty wore off. I often initiate, or at least participate, in such silliness. Once all the way home we made up variations of "Okey Dokey Artichokie", and many sides were split. And it starts. And this is going to last until... wait, how old am I? OK, never mind. Comedic timing needs a bit of work, I admit. Sometimes you can hear the wheels turning as he summons up the most hilarious statement he can conjure, as the audience waits with bated breath. He knows when he's being funny, too. He points out the funny things he says. Just like his dad. 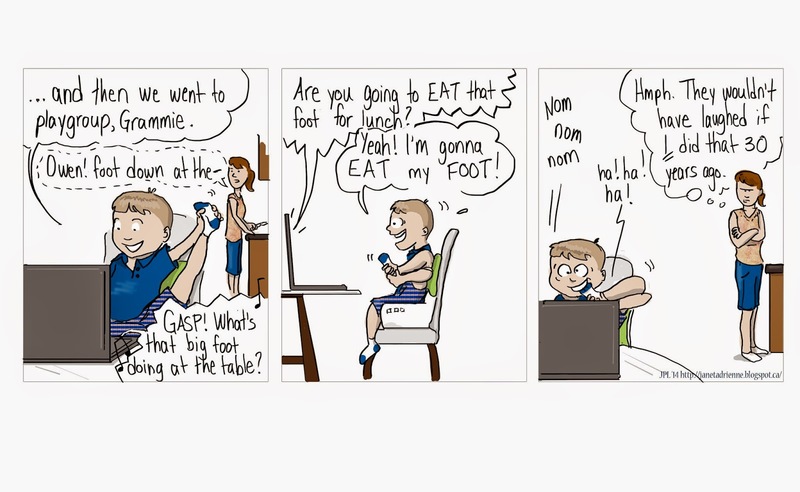 And now we're about to head East for a visit with the grandparents, and you know grandparents often have a different threshold for what's funny than parents do when it comes to the kids. He's going to have an audience, and the family going to find it all hilarious, just like they do during our Skype calls. Yes. Just what a budding preschooler comedian needs... encouragement! P.S. : I showed Big Bro all these cartoons as I drew them, and he busted a gut. He knows good jokes when he sees them. Especially since they're largely his. As usual, you've totally hit the nail on the head! I've heard many variations of all these - my deep sympathy as you enter the toilet humour years. It lasts a good, long while :). Also very popular around here, once you hit about four years old: the nonsense knock-knock joke. "TABLECLOTH ALLIGATOR. HA HA HA!" Big Bro just told me he's going to order a COFFEE on the plane... a KRAFT DINNER COFFEE. Reminded me of your Tablecloth Alligator zinger. I Read at the 2014 Blog Out Loud Event! 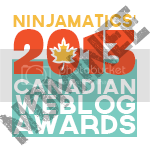 I am a lifelong (award-winning!) cartoonist and mother of two delightful boys, aged 8 and 6. 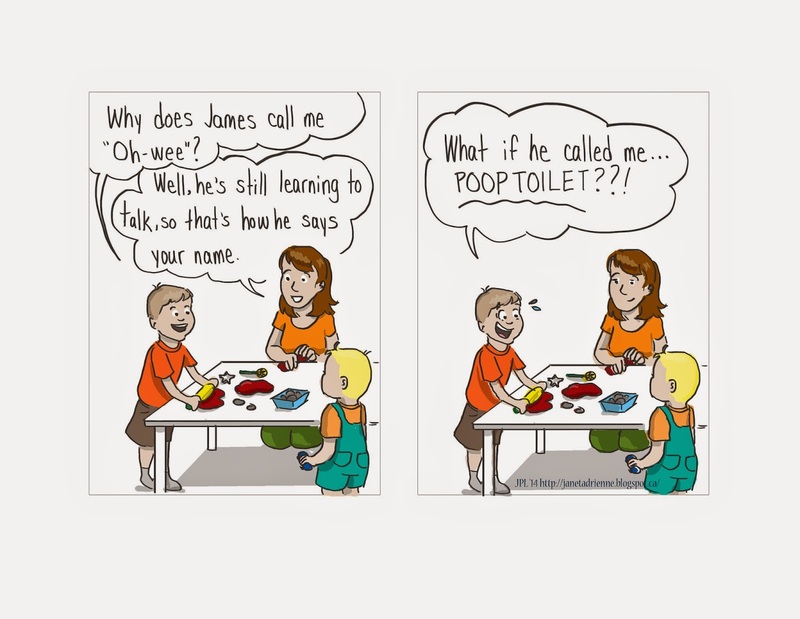 I like to view today's adventures in parenting as material for tomorrow's cartoon. Looking at family life through "cartoon-coloured glasses" helps me keep the all-important sense of humour required for raising kids... even for the events that don't seem so funny at the time. 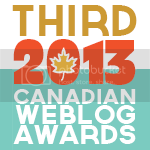 Third Place in the Humour Category! Finished in Top 5 in the Comics Category! Cartoons and other content copyrighted unless otherwise noted.